This is like the little black dress of sauces. Elegant, dependable and always appropriate – the perfect sauce for any steamed vegetable or baked fish. If you are in the mood to be truly decadent, top a grilled Porterhouse steak.. If you have any sauce leftover, store it in the refrigerator and heat very slowly, stirring constantly until warm, do not boil. 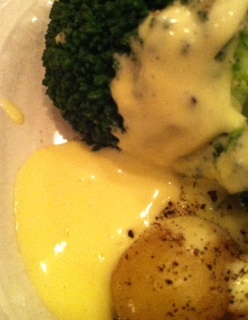 This entry was posted in Recipes and tagged Blender, Butter, Egg Yolks, Hollandaise, Sauce. Bookmark the permalink.